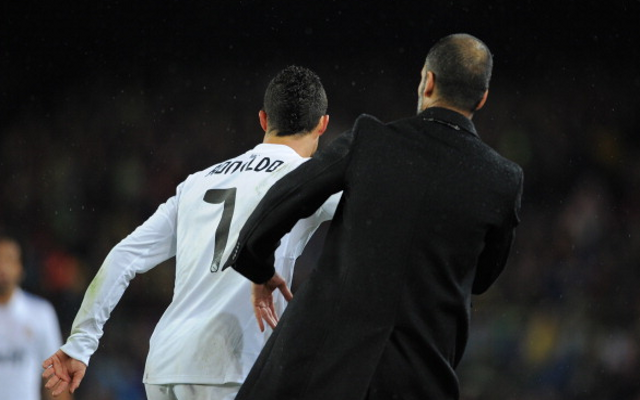 Pep Guardiola has apologised to Cristiano Ronaldo for eliminating Benfica from the semi-finals of the Champions League. Guardiola’s Bayern held a 1-0 lead following the first leg, and while the Portuguese side delivered a spirited showing to save face with a 2-2 draw in the second leg, it wasn’t enough to secure progression. Raul Jimenez opened the scoring for the home side, but a double by Arturo Vidal and Thomas Muller either side of half time gave the Portuguese giants a mountain to climb, before Anderson Talisca’s late consolation. Ahead of the match, CR7 told reporters—as per Goal—that he was hoping for a semi-final against Benfica, and speaking after Wednesday’s semi, Guardiola apologised to the Real Madrid forward for having ended his hopes. “I know that Cristiano would have liked Benfica in the semi-finals, I am sorry for him,” Guardiola told the media, as per Goal. Ronaldo would surely have loved the chance to have eliminated Benfica, having begun his career with their fierce nemeses Sporting Lisbon. The ex-Manchester United attacker shone as Real overturned a 2-0 first-leg deficit against Wolfsburg to reach the final four, scoring three times as Los Merengues advanced.